Cape Cod beaches are some of the most beautiful beaches in the world. In order to find out which is the best beach, we need to ask the question; Best for whom? Below you will find a list of the best beaches on Cape Cod for each category, including best beach for families with young children, for sunsets, the most romantic beach, and the best Cape Cod dog friendly beach. Do you like to fish? 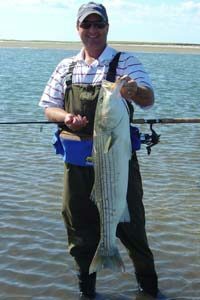 We’ll show you a great beach where you can catch striped bass while the rest of the family enjoys everything else that this beach has to offer. to take you there. This is one of our family’s favorites. It is like having your own private beach on Cape Cod. The beaches on Cape Cod offer something for everyone. The calm waters of Cape Cod Bay are perfect for young kids. When the tide goes out, the flats can extend for up to a mile offshore, leaving behind numerous tidal pools for young ones to explore. If you are a fisherman, when the tide comes in, so will the striped bass on some of these beaches. we will tell you which ones! On the south side of the Cape, you will find the beaches of Nantucket Sound. These beaches feature soft, sugary sand with warm, calm water ideal for swimming and windsurfing. This is where you will find some of the best Cape Cod beachfront rentals. On the east side of the Cape, you will find the beaches of the Atlantic Ocean. These beaches feature the cold water and crashing surf that the Atlantic is known for. It is here that you will find the dunes that capture the look of Cape Cod. A great spot for a family portrait. No matter what you are looking for in a beach, you can find it on Cape Cod. Click on the links below to find the best beach in each category. Votes From Our Readers for the Best Cape Cod Beaches! Shelby – MA – South beach Chatham, outer most harbor. I have been going for years and it’s like being on a island, almost deserted island. Just beautiful ! Na – MA – The truth is, all of them are what I like. 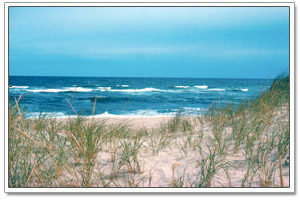 Peggy – NY – For ocean beaches it would be Long Nook in Truro for its amazing 100 foot dunes. Bay side beaches would be First Encounter, amazing at sand permutations at low tide. IB – ON – Corporation beach – it was a great calm and clean beach, no waves, shallow water, great for kids and anyone who doesn’t like waves. Kathy – NY- My favorite beach has been Nauset Beach, Orleans Ma. since I was a kid 35 years ago. Get there at sunrise,it’s beautiful. During the day, the great surf and brisk waters refresh you. Pick up the Onion Rings at Liam’s as an afternon snack. And don’t forget to go for the evening concerts at the Gazebo… family friendly and lot’s of fun. Katie – MA – Mayflower! Audrey – MA – Mayflower! Tuck – NH – First Encounter! Fantastic for kids! No crowds! Shawn – CT – Coast Gaurd Beach is by far the best beach on the Cape. Been going there for 15 years. Asia – CT – I think the best beach in Cape Cod is Mayflower beach. It is located in Dennis. The view is amazing and everyone in my family always has a blast! Tell Us About Your Favorite Cape Cod Beach!